Da Brat In Da Slammer For Da Next 3 Years. I must admit, I’m not all that surprised that rapper turned reality star, Da Brat, is going to be spending the next three years behind bars for assaulting a woman with an almost-full bottle of rum. I’m not surprised she assaulted someone, nor that she used a bottle of rum to do it; and I’m not surprised she’s now going to jail. What I am surprised about, however, is that Da Brat and Mariah Carey are best friends. Did you know that? I sure didn’t. Seems like an odd pairing, doesn’t it. But Da Brat was one of the select few people to attend the impulsive wedding of Mariah Carey and Nick Cannon, so I guess they’re tight. 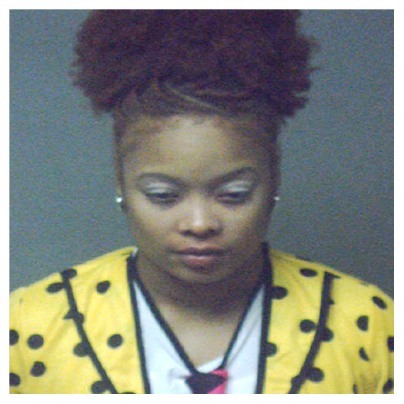 Last fall, Da Brat (born Shawntae Harris) was attending a Halloween party in Atlanta, GA when she got in a fight with Shayla Stevens, who was an Atlanta Falcons cheerleader and the time and working as a hostess that night. During the altercation, Da Brat grabbed a practically full bottle of rum and hit Shayla with it; she now has a permanent scar on her face. After pleading guilty, Da Brat was sentenced to three years in prison, seven years probation, 200 hours of community service, as well as completion of a substance abuse program, anger management, and a mental evaluation. Oh, by the way, Da Brat was arrested back in 2000 after she hit a woman at a bar; she was sentenced probation for one year. P.S. What the HELL is she wearing?? next post: Dr. Dre’s Son Found Dead At 20.